Excerpt: The Amrita University will organise a marathon programming competition spanning eight months, with the aim of ‘stimulating the intelligent minds’ of youngsters. The online contest, which will be hosted on www.codechef.com, will be held in the last four days of every month. Excerpt: Amrita University will organise a marathon programming competition that will span the next eight months. 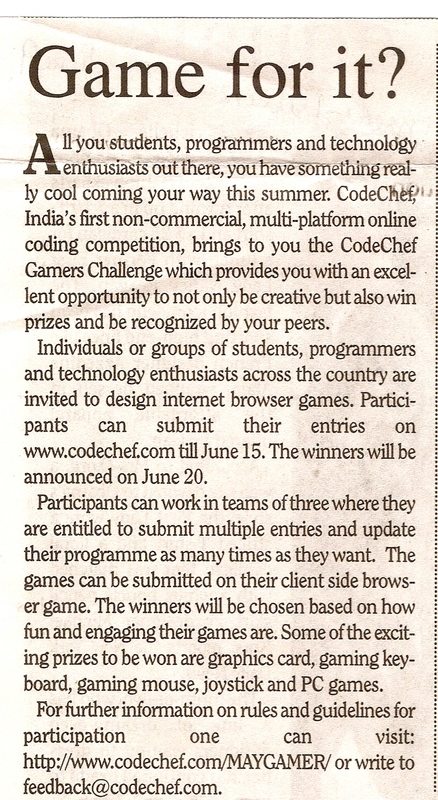 Titled “Lord of the Code,” the contest is open to school students of any age group across India. The winners will be sponsored by the University to participate in its prestigious “Battle of Whiz” programming camp to be held in December. The online contest, hosted on CodeChef (codechef.com), will take place on the last four days of each month. 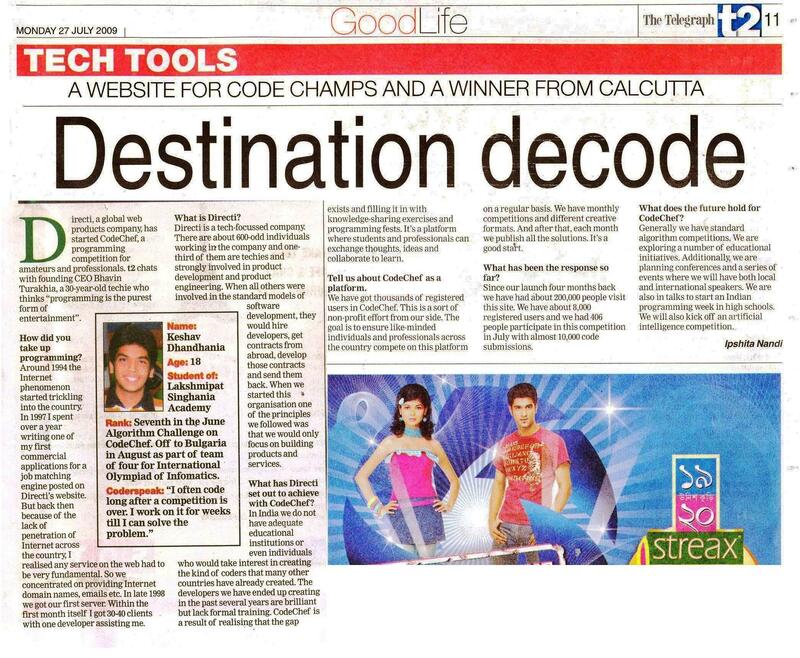 Excerpt: Amrita University has launched ‘Lord of the Code,’ a marathon programming contest for school students. A release here has said that the contest was open for school students of all age groups across the country. The university would sponsor the winners for the ‘Battle of Whiz’ contest that would be held in December. 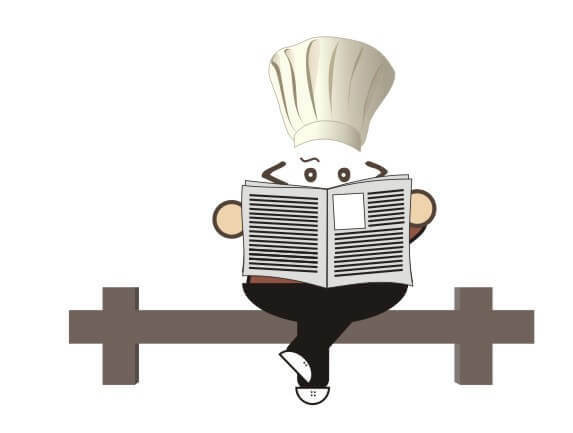 The online contest, hosted on Code Chef (codechef.com) would take place on the last four days of every month. Excerpt: ‘Techfest IIT-B’, the annual science and technology festival of Indian Institute of Technology Bombay (IIT-B), has launched three international competitions for 2014 - International Robotics Challenge (IRC), International Coding Competition (ICC) and Techfest International Model (United Nations). With a vision to provide a common platform to Indian and international coders, Techfest has also launched ICC, which will be held from October 27, 2013 and it will be hosted online on Codechef. Excerpt: With an aim to create a self-sustaining community of technology developers, The Directi Group, a leading Indian internet products company, has launched an online programming platform, titled- ‘CodeChef for Schools.’ The initiative is an ambitious effort aimed to enable Indian students to excel at the International Olympiad of Informatics (IOI) – one of the five academic Olympiads for high school students worldwide. Excerpt: Directi has launched an online programming platform, CodeChef for Schools, which is aimed at fostering developers at grass root level to create a self-sustaining community of technology developers. The initiative hopes to enable Indian students to excel at the International Olympiad of Informatics (IOI), one of the five academic Olympiads for high-school students worldwide. Excerpt: Internet products company, the Directi Group has launched an online programming platform, titled, 'CodeChef for Schools'. The initiative, the company said, is an effort aimed and driven by Directi to enable Indian students to excel at the International Olympiad of Informatics (IOI) - one of the five academic Olympiads for high school students worldwide. Excerpt: Directi’s Codechef is billed as an educational platform for aspiring programmers and developers. The site is sort of a social learning experiences where programmers can learn, practise and compete in programming challenges and contests. Directi has now announced that they will be bringing Codechef to school kids in the country by launching Codechef for schools. Excerpt: Bhavin Turakhia, CEO, Directi says it is criminal the way India ignores programming talent and refuses to celebrate its original and innovative programmers. 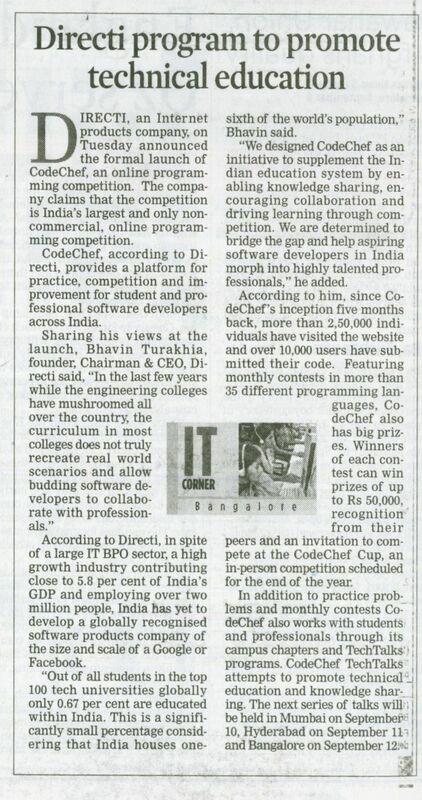 Excerpt: Directi, an internet products company, today launched "Go for Gold', an initiative aimed at helping aspiring Indian software developers excel at the world finals of the ACM International Collegiate Programming Contest. Excerpt: This international competition, currently in its 34th edition, has been run by Baylor University, USA and the Association of Computing Machinery (ACM), a society of more than 96,000 computing educators, researchers, professionals and students worldwide, since the mid-1970's as the premier programming competition. Last year 103 teams throughout the world participated in the world finals. Excerpt: 'Go for Gold is a non-profit initiative conceptualized and driven by Directi to enable an Indian team to excel at the world finals of the ACM International Collegiate Programming Contest (ACM - ICPC), the most competitive programming challenge in the world. Excerpt: "The goal is ambitious. We want an Indian team to win the ACM-ICPC Contest. To date the highest place any Indian team has achieved is 29th. A cash prize and Go for Gold trophy will be awarded to any team that does better than this. Calculated using the 'Golden Rule', the cash prize starts at over Rs.5.07 lacs in the first year and will cross Rs.10.15 lacs in the third year. 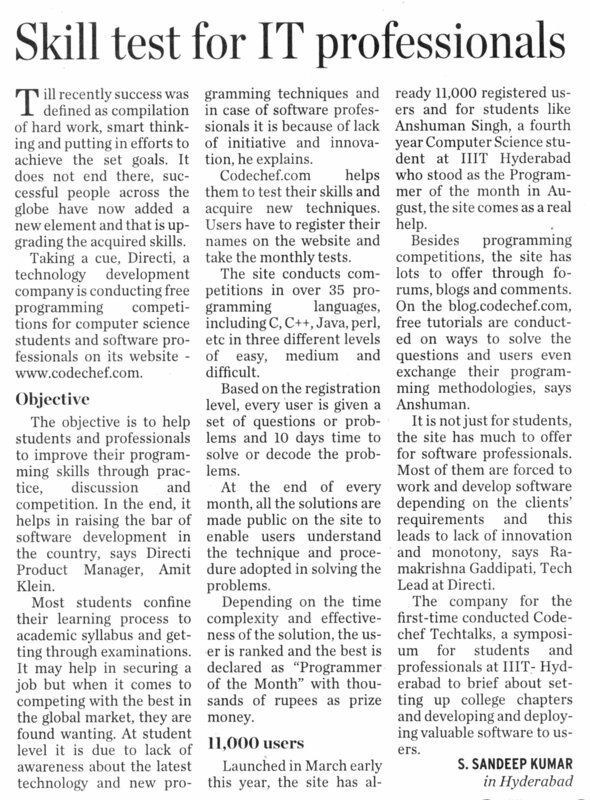 Excerpt: "Launched in March early this year, the site already has 11,000 registered users and for students like Anshuman Singh a 4th year Comp Sci student at IIIT Hyd who stood as programmer of the month in August, the site comes as a real help"
Excerpt: "We designed CodeChef as an initiative to supplement the Indian education system by enabling knowledge sharing and driving learning through competition. We are determined to bridge the gap and help aspiring software developers in India develop into highly talented professionals"
Excerpt: "Bhavin Turakhia, founder, chairman and chief executive of Directi, on how learning through collaboration and competition promotes the coding community." Excerpt: "Out of all the students in the top 100 tech universities globally only 0.67% are educated within India. This is a significantly small percentage considering India houses 1/6th of the world's population." What does the future hold for CodeChef? Excerpt: "Generally, we have standard algorithm competitions. Additionally, we are planning conferences and series of events where we will have both local and international speakers. We are also in talks to start an Indian programming week in high schools. We will also kick off an artificial intelligence." Excerpt: "All you students, programmers and technology enthusiasts out there, you have something really cool coming your way this summer. 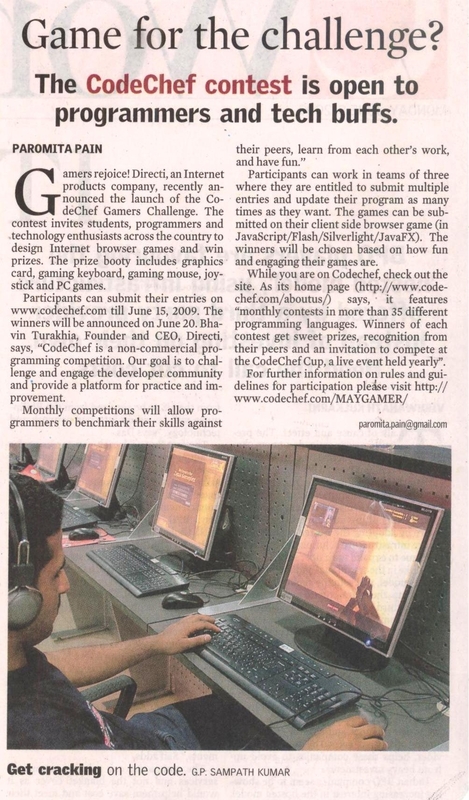 CodeChef, India's first non-commercial, multi-platform online coding competition, brings to you the CodeChef Gamers' Challenge." Excerpt: "Gamers rejoice! 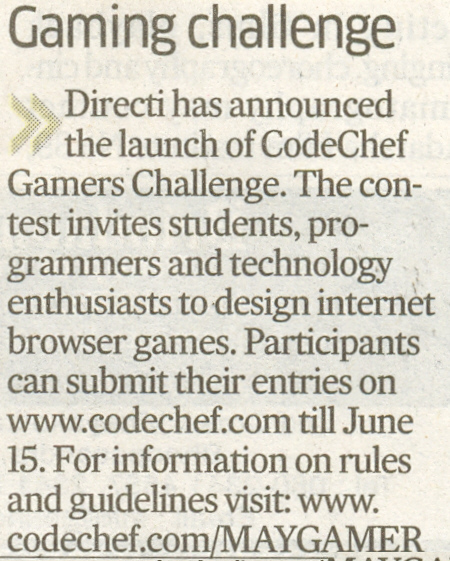 Directi, an Internet products company, recently announced the launch of the CodeChef Gamers' challenge. The contest invites students, programmers and technology enthusiasts across the country to design internet browser gamers and win prizes." Excerpt: "Do you take pleasure in fiddling around with algorithms, C++, Python, Ruby, Java and all the programming languages that some of us find incomprehensible? 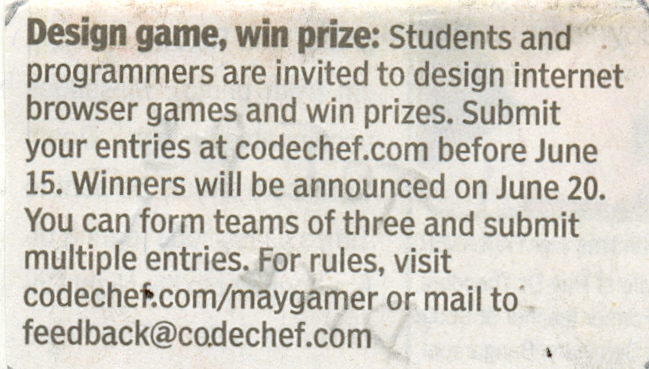 Well then, the contest at codechef.com is just the thing." Are you game for Codechef? Excerpt: "Here is an opportunity for gaming enthusiasts and programmers to get into the creative mode and design a game of their own. 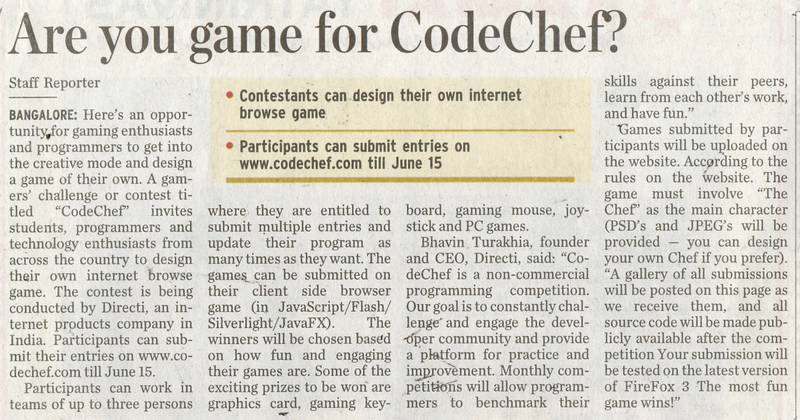 CodeChef invites students, programmers and technology enthusiasts from across the country to design their own internet browser game." 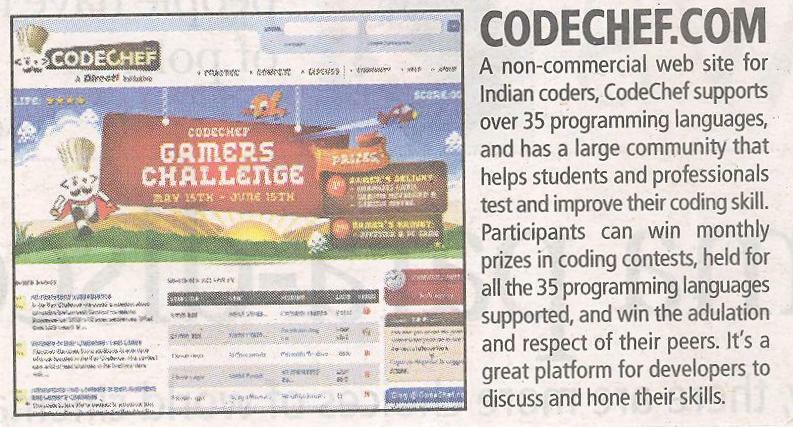 Excerpt: "A non-commercial web site for Indian coders, CodeChef supports over 35 programming languages, and has a large community that helps Indian students and professionals test and improve their coding skill." If you have any queries about CodeChef, want to fix up an interview or know more about CodeChef for any media publication, do get in touch with our Media Contact.